Recently, a marketing firm hired me to help them sell bigger projects. I suggested that they beef up their proposals and pitch bigger projects to their prospects. “We can’t do that,” my client explained, “because we’re already too expensive for many prospects, and losing that business.” In my years working with small businesses, I’ve found that this situation is very common. To solve it, we changed their proposals. Instead of pitching “the plan,” they offered clients three choices: small, medium, and large. Now, instead of “take it or leave it,” clients had choices to fit their budget. Immediately, a higher number of their proposals turned into paying clients, and they soon landed two projects of record size! Today I’ll show you how to close more and bigger projects by offering options to your clients. Most businesses I work with pride themselves on customizing their work for every client. Typically, they assess the potential client’s needs and then prepare a custom-tailored proposal. They present the plan and the price, and they hope the client says yes. Offering only one possibility locks your customer into a yes or no decision. Imagine a mattress store that only sold firm mattresses. They’d lose a lot of customers. More choices enable more people to buy. Starbucks offers tall, venti, and grande. A new condo building offers studio, one-bedroom, and two-bedroom condos. When you offer your customers three options, small, medium, and large, you accomplish two things. First, you allow customers with limited budgets to say yes, and hire you. And second, you allow those who can afford more to write you a bigger check. When the marketing firm I mentioned earlier started offering a “large” option, they were shocked at how many prospects were interested. That included a number of prospects they had thought were very budget-constrained. To get similar results for yourself, inspire the client with the possibilities, were they to step up with a bigger investment. What kind of amazing results could you create for them?! Be sure to talk benefits, not just features. First, ask your client what their budget is during the consultation phase. This gives you a ballpark to base your proposal around. Some will say “I don’t know” or “I don’t want to tell you.” In this case, do what my general contractor client does, and ask, “Are we talking two million or twenty thousand?” (Scale the range to your own business type.) As the contractor told me, “look to see how scrunchy their face gets” when you throw out the big number. From their reaction you’ll get a good sense of what they’re thinking. In situations when you think your standard option is comfortably in their budget, make this your small, and create a medium and a large. This way, you stretch your client’s thinking about what is possible. If you make those bigger packages sparkle, you might inspire them to step up to a program larger than they had initially intended (or budgeted for). Even if they stay with the smallest option, you have planted a seed for expanding the project in the future, or for Phase 2. As you present the options to your client, make a recommendation. People will appreciate your guidance; after all, you are the expert in this field. Recommend the option that you honestly think would best serve their goals, stretching the budget a bit beyond what you think they were planning to spend. If you do a great job painting the picture of what’s possible, you will often find a willingness to stretch and invest more. 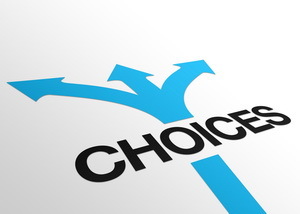 Another huge benefit of offering options is never again asking the closed-ended question, “So do you want to do it or not?” Now, you can say, “Which of these options would serve you best?” The positive assumption gets your prospect thinking about what is possible, rather than being tempted to stay with the status quo. What has worked for you in offering your clients options? What challenges have you run into? Share your stories by posting a comment below!